Hardboiled comic fans are a rare breed; tough guys don’t usually do funnybooks. Yeah, yeah, I know—Mickey Spillane got his start in the comics, and his illustrated private eye Mike Danger eventually begat Mike Hammer. Batman calls himself a “detective,” and he’s certainly tough, but there’s all that fetishistic rubber to deal with. (Not knocking Christopher Nolan’s reimagining of the series, though—that was cool.) And while Sin City has been around since the early 1990s, I’m willing to bet you never heard of it until this past April, when Robert Rodriguez showed us his version of Frank Miller’s noirville where blood runs in both red and yellow. Ditto with Max Allan Collins’ Road to Perdition, brought to the screen by Sam Mendes. You can see what I’m getting at. Hardboiled readers. Comic books. Kind of like peanut butter and mayonnaise. Two great tastes that don’t most people don’t think to put together. At least that’s what I thought until I picked up my first 100 Bullets trade paperback collection, First Shot, Last Call (DC Comics/Vertigo, 2000). It may not have come first, but it’s the one that does it best. The first image: A gun to a young woman’s head. We’re in some back alley. It’s pouring rain. Narrator: It’s a long story. Turn, the page, and we’re inside the shower of a women’s prison. C’mon. How can you turn away from that? The genius of 100 Bullets is often what Azzarello doesn’t do with the story. Let’s start the series’ main conceit: a creepy old guy who looks like the love child of Steve McQueen and Lurch—named “Graves,” no less—hands you a suitcase containing a gun, 100 untraceable bullets, and evidence. The evidence? Irrefutable proof that somebody done you wrong. Maybe it’s the woman who ratted you out to the drug squad years ago. Maybe it’s the guy who killed your wife. Maybe it is your wife. We’re in noirville. Anything’s possible. And so you have this gun with untraceable bullets. Even if you decide to pop a cap in the head of the Pope in the middle of Times Square, cops will dig the bullets out, check with their superiors and then let you go. “Sorry, Padre. We’ve gotta let the kid walk.” God may not forgive you, but the NYPD will. Grave’s case of guns and ammo is free ticket to murder anyone. Anywhere. Anytime. This presents an interesting moral question: What do you do? Do you take revenge? Do you kill? Or do you take the high road? And that’s assuming you can find it? What’s great is, Azzarello avoids the obvious. In other words: Each issue of 100 Bullets isn’t about a new chump/chumpette getting his/her hands on the gun, and exacting ironic vengeance. That would be the lame TV version. A high-caliber Fugitive, a noir Love Boat where you just know that, sooner or later, guest star Jessica Simpson is going to end up with the friggin’ suitcase. Instead, the suitcase is your entrée to world of a centuries-old secret society called “The Trust” and its seemingly dormant band of lethal enforcers, “The Minutemen.” (As you may have guessed, Graves is one of those Minutemen.) Along the way, the activities of The Trust collide with a surprising cast of characters, from a female Latino gangbanger to an ice cream truck driver to a gas station attendant in El Paso to Marilyn Monroe (sort of). To be honest, The Trust/conspiracy stuff is fine, but it mostly serves as a cool backdrop to the individual stories. Much like Neil Gaiman’s Sandman series is big story vehicle (the struggles of Sandman and his siblings were beside the point, more often than not), 100 Bullets is a treasure trove of crime stories set in the same universe. A multitude of crime/noir subgenres are represented; it’s as if somebody took a stack of Manhunts and threw them in a blender with pages of Ellroy, Leonard and Bruen, with more than a pinch of Hammett, Cain and Stark. Azzarello knows all of the hooks; the fun is watching him riff, issue after issue. One of the most shocking early stories is the pleasantly-titled “Heartbreak, Sunnyside Up” (100B #11). Here, we meet Lilly, a 30something waitress at a rundown diner who’s married to Phil, and obviously older car mechanic. Squint, and you’d swear you’re meeting the couple from The Postman Always Rings Twice. They seem happy enough, except for the fact that their teenage daughter Tina ran away four years ago, and Lilly’s never quite recovered. She’s hoped for the best, though—hoped that her daughter made a decent life for herself. Then Agent Graves shows up, and tells her that ain’t necessarily so. He knows what happened to Tina. And he proceeds to tell her. In a few, excruciating details. It’s all done though dialogue, and that’s what rockets you to its violent and—as the title promises—heartbreaking conclusion. Finish that, and you won’t be the same the rest of the day. Not bad for a funnybook. It’s about seven o’clock in the evening, mid January, the sun nothing but a cigar cherry, as an old man’s weak piss of rain gives an oily shine to Tinseltown. This morning, I woke up in a hospital. Each dialogue balloon is paired with the image of the dealer’s potential customer, and damnit if our dealer can’t tell the weed-smokers for the ecstasy-poppers. It’s one of those small details that lends stark realism to the series. The only way to get it more authentic is to head to lower Manhattan to score. A bit of trivia: the titles clue you into the number of the collection—sometimes, it’s obvious (A Foregone Tomorrow is #4), sometimes not (Samurai is #7… get it?). Yeah, it’s probably too clever, but so what? I say Azzarello can get away with it. I keep mentioning the name “Azzarello”—but it’s not like he does this alone. The look of 100 Bullets comes from the mind of Argentinean illustrator Eduardo Risso, whose drawings mirror Azzarello’s story perfectly. It’s not as stark as Sin City, nor is it black it white, but Risso’s limited color palate evokes the best of the classic noir flicks. His style is ultra-distinctive, too. I could recognize a panel of 100 Bullets from 100 yards away. The latest collection is the eighth, The Hard Way, but I recommend going back to the first, or trying The Counterfifth Detective (especially if you’re a private eye fan). You might also track down some of the stand-alones that will introduce you to the world of The Trust without hurting your head too much. I recommend the aforementioned “Heartbreak, Sunnyside Up” (#11), “Idol Chatter” (#27), or more recently, “Coda Smoke” (#58). Yeah, they’re funnybooks, but they represent the best of what crime fiction can do. Mark my words: if Brian Azzarello were to someday pen a crime novel, it’d hit the genre like crack hit the Bronx in the 1980s. Hey—let’s talk him into it. 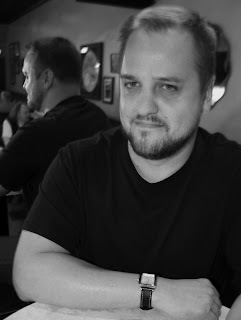 Duane Swierczynski is the author of several crime thrillers, including the the Shamus Award-winning Fun and Games, the first in the Charlie Hardie series published by Mulholland Books, as well as the Edgar-nominated and Anthony Award-winning Expiration Date. Many of these books are currently in development for film and TV. He currently writes the IDW series Judge Dredd, the Valiant Comics series Bloodshot, the forthcoming Dark Horse series X, and has written about the Punisher, Birds of Prey, Godzilla, Cable, the Immortal Iron Fist, Werewolf By Night, Black Widow and Deadpool. Duane has also collaborated with CSI creator Anthony E. Zuiker on a series of bestselling “digi-novels” which include Level 26: Dark Origins, Dark Prophecy and Dark Revelations. In a previous life, Duane was the editor-in-chief of the Philadelphia City Paper, and has worked as an editor and writer at Men’s Health, Details and Philadelphia magazines. In a previous, previous life, Duane, then known as “Cliff Dohower,” died of tuberculosis in Wisconsin in 1957.